Way back in 2014, Google made it known that if your website was not secure (i.e. does not use SSL encryption), it would negatively affect your firm’s search engine rankings. 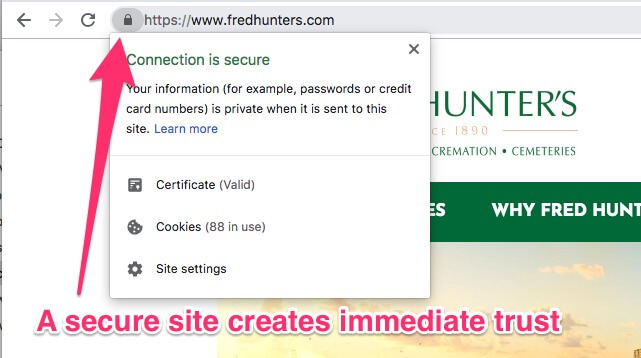 Now, Google has dropped a hammer on insecure websites, including many funeral home websites. You see, recently Google implemented a change in their popular Chrome browser, which is used by about 65% of all website visitors; now, if your website is not securely encrypted using SSL certificates (i.e. doesn’t start with HTTPS), the browser prominently advertises a “Not Secure” warning label to your visitors. Having “Not Secure” splashed across the top of your website obviously results in a poor first impression among your visitors and breeds distrust. Considering the lost trust and negative impact to your firms’ SEO, it should be a no brainer to make your site securely encrypted. Unfortunately, many website providers simply don’t provide this option, due to the difficulty and expense of implementing it. 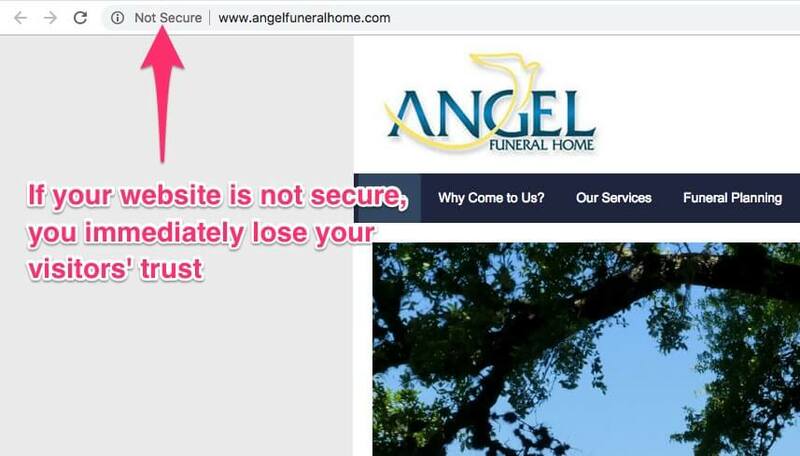 Given the importance of keeping your website secure, Funeral Innovations proudly provides SSL security for every one of our website customers at no additional cost! We feel it’s absolutely critical to making a great impression with each and every website visitor. Having a secure website is a prerequisite for building trust and keeping good search rankings for your business. If you’re not sure whether your site is secure, visit it in Google Chrome and check for the little padlock icon. If it’s not there, or you see the “Not Secure” label, be sure to contact your website host and ask them to implement SSL encryption. Or contact us and we’ll get you set up with a modern, secure, SEO friendly site that gets real business results.